Since Kathy over at I am a reader is taking a break this summer, I am going to host a few of her normal hops. Please be a bit patient with me since this first one will be a learning experience! For host blogs it means lots of new visitors and followers. Of course if you host a giveaway on your blog you can also enter all the giveaways on the other blogs. You must host a giveaway on your site, you are responsible for obtaining a prize for giveaway and taking care of the shipping charges. You must giveaway something a reader, author or blogger would enjoy. 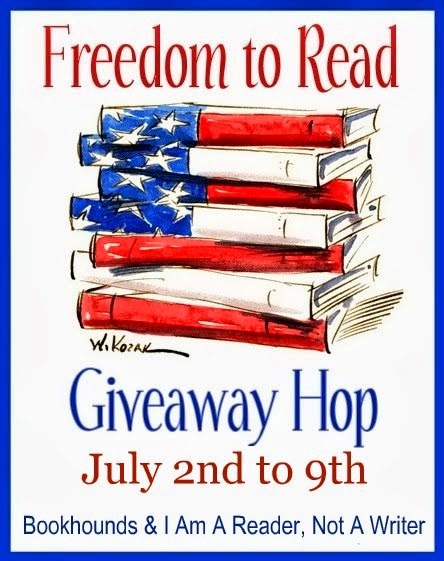 Your giveaway post must include the hop image & linky (or links to the host’s sites if you can’t get the linky to work). Please only 1 mandatory entry – all others must be optional – Keep It Simple! No long lists of things for people to do. If you have dozens of things for people to do I will delete your blog from the linky. The giveaway must be specifically for this hop. If you are using Rafflecopter set it to begin on JULY 1st and to end on JULY 10th. Do not use the Point Values +4, +5, +10 or +25. To sign up to host a giveaway add your blog to the linky. Please include your shipping info in parenthesis following your blog name (US) (US/Can) (INT) – if you don’t include shipping info I will assume you are shipping to US only and edit the linky for you. I just signed up #48 Jess resides here and forgot to include that it's international. Could you fix this for me please. Thanks. Yes, Jessica -- I will get that fixed! I am 144 - Guiltless Reading. Sorry, Mary, mine should be US/Can only.